The passion behind the design is wonderful! I love the fact that they are multipurpose and unique! It was a pleasure meeting you a couple of days ago in the Columbus Circle Christmas Market when I bought one of your stones. We are now back to my house in Barcelona, Spain, after a wonderful break in NY with my great family and my stone is bringing me such joy! I wish you all the success with your stone business and a wonderful Christmas with your family and friends. I have some friends visiting NY in December and will tell them to come and visit you! Actually, I think I will ask them to buy me another one! We came to visit your shop a few weeks back and my boyfriend who is 6'7, absolutely loved your stone light collection! You welcomed him in, even though he had to carefully duck to get under the exterior awning. Once inside there was such a calm about your shop - both of us loved your collection. The back wall where you had lined up a bunch of smaller votive sized stones with the LED's inside, was so inviting and lovely and exactly how I would set them up too! Gorgeous! Hi Red, We met at the Columbus market this past Wed. We talked for a while, I went to dinner and came back and bought 2 pieces from you. I told you that I really felt your space had great energy. So I have to tell you that I am loving the candle holder and base piece. It's really beautiful and I find it SO very relaxing. I really love these stone lights. I bought a candle holder and base for the first time a year ago and have been using it everyday since. After the first few days with it I took a train back to NYC to buy 2 more sets for good friends of mine that I knew would appreciate it. I find it to be so relaxing, calming and even sleep inducing that a day has not gone by without me using it. 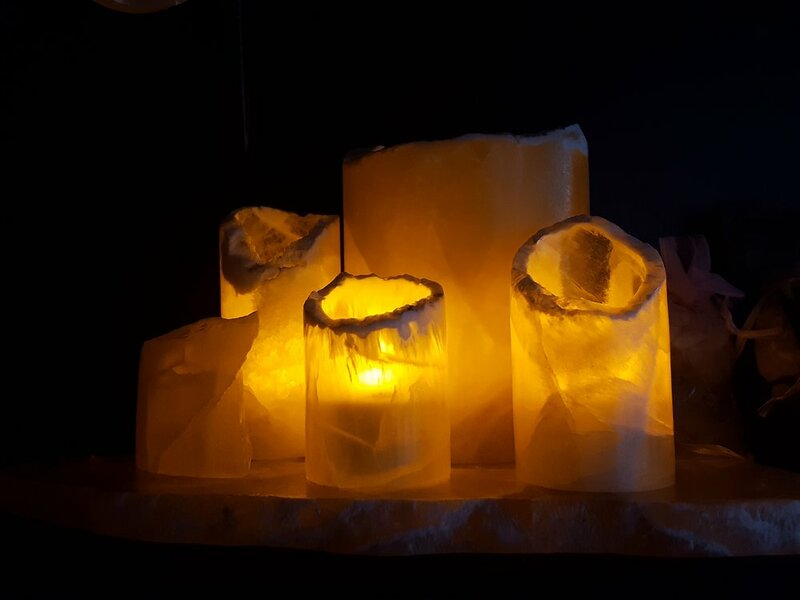 It is beautiful to look at and a lit tea light inside makes the stone light dance with light and warmth. I love it so much I went back to the Columbus Circle Market again this year to say hi to Red and just had to buy a second set that caught my eye. It is hard to explain the positive effect this has had on my physical and spiritual health, but I believe the frequency of the vibrations of this natural stone has made a huge difference for me. I encourage everyone to have a set for relaxation at home. The stone is simply beautiful. Thank you so much for the beautiful luminite candle holder & base! I'm already enjoying its light frequency, & have put the smaller pieces into my shop for others to experience this peaceful stone for themselves. I love love love my candle!! I feel like I have a piece of nature right in my home and it's beautiful! It feels like it is grounding my space. The beautiful lady who sold me the candle holder made the experience even that much more special. What a warm and kind soul! I am so happy with my purchase. All good energy! !